Plasmodium knowlesi has been recently recognized as the fifth species of Plasmodium causing malaria in human populations in south-east Asia. Plasmodium knowlesi occurs in nature in long-tailed and pig-tailed macaques , that are commonly found in forested areas of south-east Asia. Until a few years ago, infection with P. knowlesi was regarded as a rare disease, occurring only sporadically in humans . The recent findings of a large number of infected patients in Malaysia Thailand , Myanmar , the Philippines and Singapore , have changed that perception of P. knowlesi. This parasite has the shortest erythrocytic cycle among the primate malarias, (only 24 hours), and high parasitaemias with fatal outcome in humans can occur .Under the microscope, it is not possible to distinguish between P. knowlesi and P. malariae due to their similar morphological characteristics. Human P. knowlesi infections resolve rapidly following treatment with chloroquine and mefloquine is also an effective anti-malarial for knowlesi malaria. However, due to the rapid rate at which P. knowlesi can multiply, in severely ill knowlesi malaria patients with high parasitaemias, management and treatment as for severe falciparum malaria is being recommended. 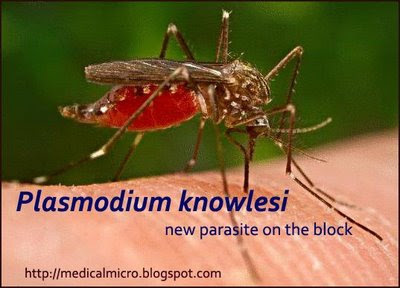 For more information on Plasmodium knowlesi, click here.